You should know, I’ve seen the stage production of Les Miserables 4 times and listened to the soundtrack about 537 times, so I consider myself qualified to write this review. This must not have been an easy production to adapt to the screen, and I thought Tom Hooper, the director, did an amazing job. Much ado has been made of the fact that he had the actors sing live on camera, rather than the traditional method of lip-synching to a pre-recorded soundtrack. His approach paid off in the acting performances – the emotions are fully expressed and the performances feel much more intimate than those experienced by an audience watching the musical on stage. Unfortunately, the singing takes a small hit. I would imagine it’s more difficult to deliver a technically strong *singing* performance while hauling in a naval vessel with a rope as a slave (hello, Jean Valjean) or running through the streets of Paris, chasing after aforementioned slave (bon jour, Inspector Javert). Speaking of Javert, I take issue with with the casting of Russell Crowe in that part. While Mr. Crowe looks great in a uniform and possesses a surprisingly lovely singing voice, it is not the powerful baritone one has come to expect from a Javert. It’s like getting a chocolate easter bunny then biting into it and realizing it’s hollow – wtf? and what’s with all that air? I loved the actor who played Marius, although in his early numbers his head would start shaking like it was about to explode a là Scanners and his freckles were a bit distracting (when I think of French revolutionaries, I don’t think of them as having freckles). However, he more than made up for that with his performance of Empty Chairs, which broke my heart. Amanda Seyfried as Cossette? She has the largest pupils, ever. She also has a pretty voice, but it felt too closed and fluttery during her high notes. Sacha Baron Cohen and Helena Bonham Carter were well-cast as Monsieur and Madame Thenardier, but a lot of the slapstick humor that plays well on stage for those characters is lost on screen, and the quick editing makes it tough to follow all their shenanigans. 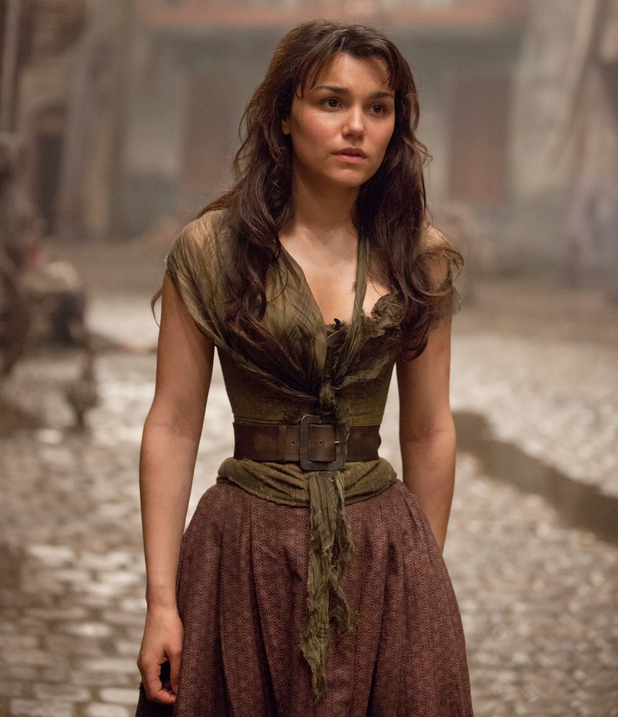 I’ve never heard of the actress, Samantha Barks, who played Eponine but I loved her, even though it looked like her waist had been carved out by CGI. Anne Hathaway. O.m.g. (which stands for Oscar, My God.) She was amazing. I heard people in the theater sobbing during her scenes. I managed to suppress the ugly cry, but it was tough. And finally, Hugh Jackman. He really was excellent, even though I thought his voice was a little nasally. But when he tore up his parole paper and nailed the high notes on “2…4…6…oh…ONE!” and the two veins on his forehead popped into 3-D, I knew he had that Oscar nomination locked. Finally, I’d like to know if there’s a makeup category for dental special effects because the teeth on those actors were gnarly. You could even see the bloody stump from Fantine’s missing tooth. Every actor looked like espresso grains had been painstakingly applied to their gums. If there is a category for Best Tooth Grime, Anne Hathaway won’t be the only one from Les Miz walking away with gold on Oscar night. With the minor dings for some of the singing, I would give Les Miz an 8 out of 10….stars? I don’t know what my rating system is. If I were you, I’d go see it. I literally just got home from seeing the movie (after my own two theater experiences and 800 listens) and I agree with every single thing you said! LOVED Marius’ voice, especially on “Empty Chairs” and Ann Hathaway had me sobbing out loud, while clutching the hand of my also sobbing daughter. Eponne is performed by Samantha Barks. She also sang on the 25th Anniversary Les Miserables Concert DVD which was performed in 2010. I thought her solo On My Own was the highlight of the film. Nothing against Hathaway – but Fantine came and went so quickly – and so early in the film. Yeah, bring kleenex is absolutely right. Otherwise you’ll have to deal with a wet face.